"It has lost its charm." "It is not as good as it was." "There are so many new places to try." Among such comments, came the sweetest five words I've heard in a while. "Karim's? You must try it." A friend in need is a friend indeed! During my visit to Delhi after almost 20 years, I didn't care what Karim's had become. I simply wanted my date with this culinary bigwig. Much like Koshy's in Bangalore, I realised that most of those wondering why I wanted to visit Karim's were a lot younger to me. So when my schoolmate, now settled in Delhi agreed that if I've never visited Karim's, it doesn't matter what people say, I was looking for something to gift that gentleman. Since we were only two of us, I was wondering if I will get to taste a few dishes. "Keep ordering, I'll take of it," he assured. Dude, where were you all these years? Since I left my orders to the waiter, every word he said was music to my ears. 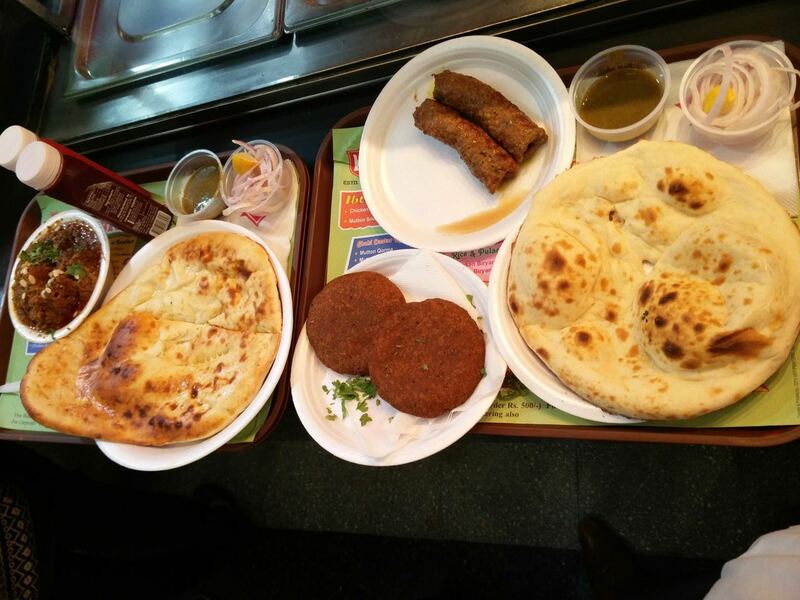 Finally, we settled for two kebabs - a Shami and a Seekh, two breads - tandoori roti and Roghini Naan, and a gravy - a Shahjahani Murgh, I think it was. "Will this do?" he asked. I assured him that this should douse the fire of having never tasted food at Karim's. Looking at all the food, I started salivating. 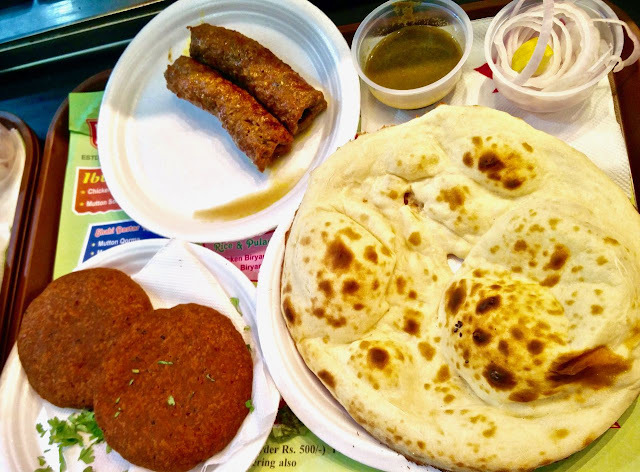 Being a huge fan of different breads, I wanted to dig in straight into the beautiful looking tandoor roti and the Roghini naan, but the sight of the round Shami kebab got to my hands first. Though slightly dry on the surface, the rest of it was super super succulent. Being used to rubbery kebabs in small stalls, the soft, perfectly cooked Seekh Kebab also tickled my taste buds and the aura around Karim's was slowly coming down. Finally I got my hands on the breads. 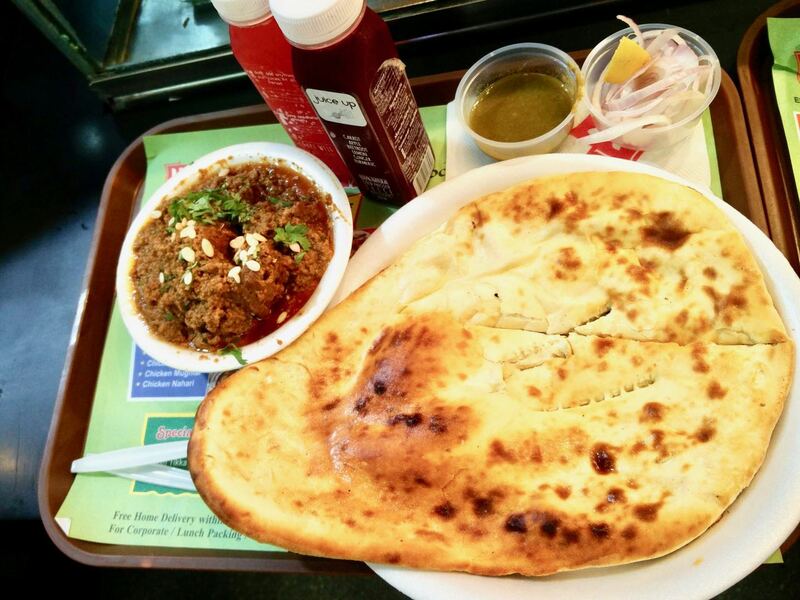 The oil less Tandoori Naan, puffed up beautifully was a delight to look at for this Chennai-vasi. Dipping into the rich thick gravy which had loads of minced meat on top and full chicken breast hidden inside, the naan slowly and steadily disappeared into my tummy. The Roghini naan with its slight hint of sweetness slowly caressed the richness of the same gravy as it made its way past the tongue. I wanted to order every variety of bread on the menu, but decided to leave some for my next trip here. If you've never been to Karim's (and if you were born in the '80s), no matter what anybody says, it warrants a visit. Our bill was about Rs. 780 for the above, but my tongue, brain and tummy finally got their tryst with Karim's.